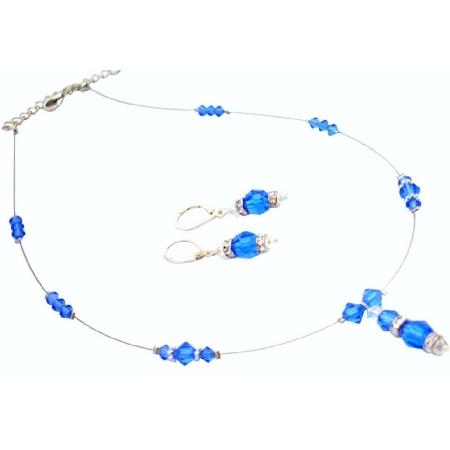 This is a gorgeous crystal necklace & earring set. This very beautiful set is adorned with Swarovski Sapphire & Clear crystals in different shapes & sizes accented in illusion wire with genuine sterling 92.5 lever back earring. We have handcrafted each Necklace using our own original designs for or can customize jewelry for you. Material Used : For Necklace 4mm & 6mm Sapphire Bicones. For drop down 6mm & 8mm round sapphire crystals with 4mm clear crystal bicone & silver spacer rondelles at bottom. For earrings 8mm round sapphire with 4mm claer crystal bicone with rondelles at bottom. Earrings in genuine 92.5 sterling silver lever back hook.